Accelerating and avoiding the tendency to hesitate is easy to say, but we all know as women leaders who live a full life every day, it’s not always easy to do. We can always use a little inspiration to keep moving forward. 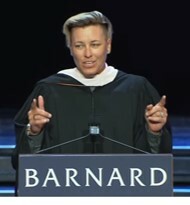 I recently found some inspiration after reading and listening to Abby Wambach’s commencement speech delivered at Barnard College. Following is a summary of the highlights of Abby’s speech found in a piece written by Bob Woods in Strategy & Business. Here is the link to the 25-minute speech Abby delivered at Barnard, if you are interested in capturing the full force of energy and inspiration.